WHAT: Opening Reception of Harriet Diamond's installation sculpture "Driven From Their Homes"
WHEN: Friday, March 10th 5-8 pm. Show runs through March 26.
with additional hours on Fridays from 5-8 pm. ARTIST TALK is Thursday, March 23 at 7pm. 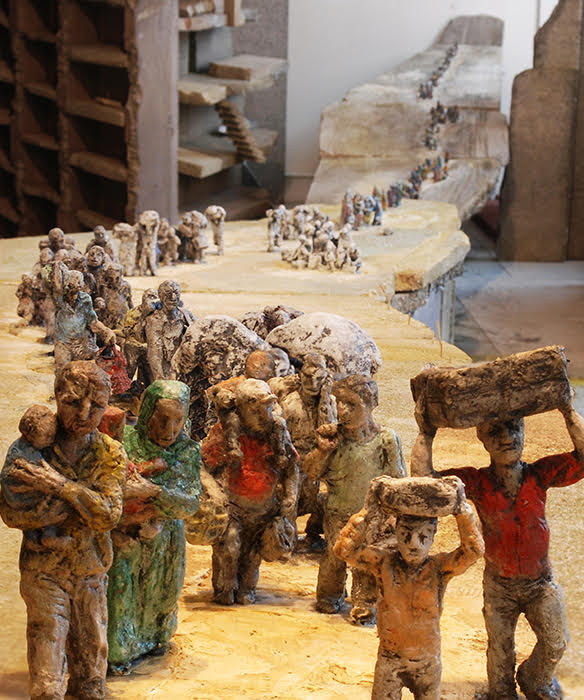 This new installation depicts an episodic journey of refugee people from the terrible destruction of their home city to possible escape by boat. 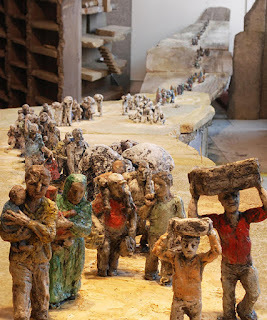 The largest part of the installation, what I call The Long Line, depicts hundreds of fleeing Syrians and in the background looms the destroyed city, Aleppo or Homs. It is a dark scene, but it’s also roiling with life. All the human emotions—fear, hope, grief, desolation, endurance, effort, ingenuity, adventure, courage and heroism—are here in the faces of these victims of war. What I see in these faces is the opposite of the depravity of war makers. These people are centered on the true core of our common human struggle—keeping life and limb together, saving the family, trying to help neighbors, thinking through difficult logistics.